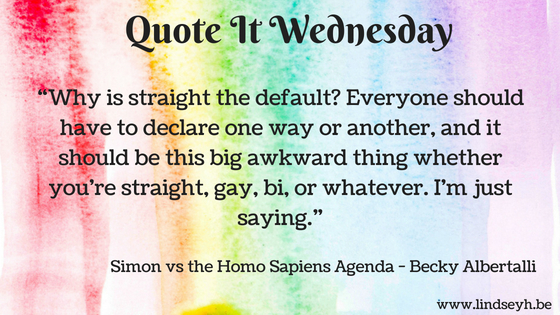 Today’s quote is in honor of Pride Month and one of my favorite quotes from one of my favorite LGBTQIA+ themed books: Simon vs the Homo Sapiens Agenda. I love this quote for the simple truth it holds. Why is straight the default? Why do we always assume everyone we meet is straight until proven otherwise? Why shouldn’t straight people have to come out too? Sexuality should indeed not just be assumed. There should not be a default. Do you have any more lgbtqia+ books and quote suggestions for me? Ah I love that quote!! ❤ I need to read Becky Albertalli’s books! !